The Ordinary Life of an Extraordinary Girl: Braces off!! “I am the luckiest girl in the whole world"
"I want to call Daddy Dad now, he is not John"
After almost two years Alex got her braces removed. Her teeth are straight; the gaps closed and she looks beautiful. She still has a couple jagged teeth which will need some dental cosmetics, especially the chipped tooth from her bicycle accident four years ago. The orthodontist was able to file one front tooth, but he mentioned the others should be filled to match their partners. Braces are not an inexpensive proposition. Despite suggestions to the contrary, I never wavered from my belief that Alex is entitled to the same advantages as her siblings. She deserves a bright, straight smile just as much as her brother and sister, who have both finished their orthodontial care. Alex’s timing was a little different in terms of the braces going on. Her teeth came in an odd pattern, and she had to have a number of teeth extracted. Her baby teeth were never good at falling out on their own so intervention was need. Thus Alex was 15 when her braces went on and almost 17 when they came off. Alex was so overcome with happiness with her new found smile. 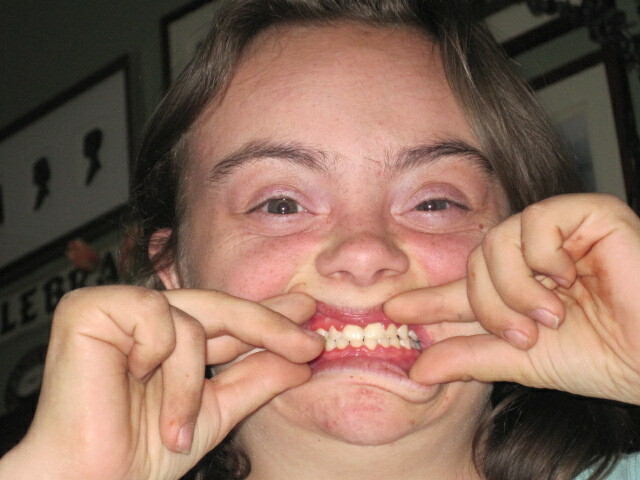 I never knew the simple removal of braces could make such a difference in the life of a 16 year old girl with down syndrome. It was worth every dollar of this investment in my daughter’s smile to see her use it. This is great! Congratulations for getting through all those appointments! I've been surprised at how well Hannah tolerates her braces and appointments. Can't wait to see Alex's naked smile!